For me, warriors are people who challenge the systems that create the conditions we live under. 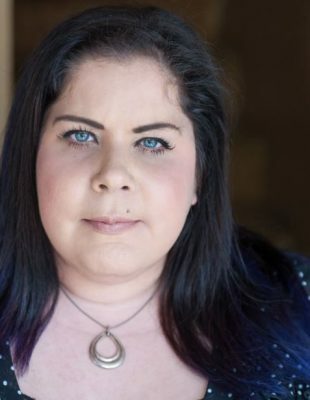 “Challenging” can mean storming Ottawa or Washington, DC to change laws or it can be sitting in the waiting room of a psychiatrist’s office at a place of total honesty about how our very minds are betraying us. Warriors see a bigger fuller version of who we can be as people, as a society, as humanity and work towards that end goal. If you are a woman challenging a system in whatever way you are, you know you are in a marathon. This is not a 100-metre sprint. So, how do you keep yourself healthy for a marathon? When we work towards changing a system, there is an awareness that maybe whatever we are working towards will not change or end in our lifetime, but we are working at this for future generations. So, how do you not get discouraged when you don’t see change or when you see things actually take a step back? For me, it’s three things. One is, I need to leave this world knowing I fought to create a better one for my grandchildren. (Future, hypothetical grandkids who will call me GG) and the little people my friends are bringing into this world. Such a small word for such a big task. How do you find hope in the midst of the battle? How do you take a step back and breathe deeply? I think it’s found in the third thing on my list. To be honest, this wasn’t going to make it on my list. I was going to rally the troops, be inspirational, pat us on the back. But can I be honest here? Writing the word “warrior” as many times as I already have, finds me exhausted and brings me to where this article is surprisingly going. What do warriors do to take care of themselves? How do you make sure you can stay in the fight? I wrestle deeply with this one. There’s a narrative that says women’s self-care is a bubble bath and wine or a mani/pedi, but what if that’s not your jam? What if you’re too tired—too weary—to venture out into public and the thought of sitting in your own dirty water kinda grosses you out? Here’s my heart on my sleeve: When I am bone worn out, when I am done, I get paralyzed. I don’t know what to do. I am not sure of how to take care of me. Thankfully, I am surrounded by loved ones who do, but in the moment until I have contact with them, I couldn’t even tell you what my favourite song is and here is where we are going that surprised me. It’s ok to not know how to do self-care. Kind of a weird statement, I know, in this day and age of Google and self-help everywhere. I always have people asking, “What do you do to take care of yourself.” I used to think they were asking as a check in to make sure I was ok, but gradually I realized—actually they were asking because they weren’t too sure about it either. Then I started talking to more folks and they had a set answer, but when you scratched the surface more than one or two people admitted they did the routine, but it wasn’t necessarily life restoring. Relaxing, but not restoring. So, how do we restore? As people of faith, I think we look above—outside of ourselves. My hope is for the world to come into Kingdom order. That is my soul’s cry. 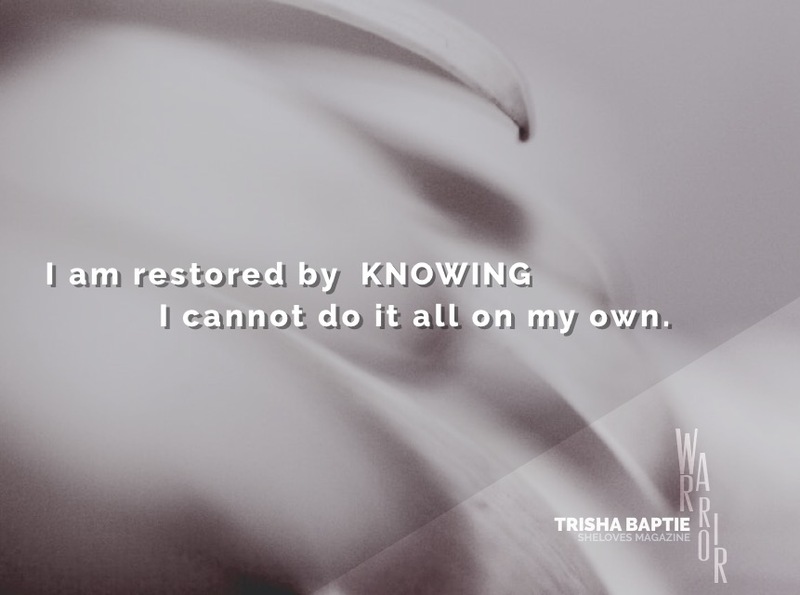 I am restored by knowing I cannot do it all on my own. I need friends, allies, loved ones and support, because I know the issues will always be with us. Jesus said, “The poor you will always have with you.” Issues of injustice will not be solved in my lifetime. Sure, parts of an issue maybe will change, some laws will be put into place or struck down, some policy may get ratified, but I am restored by knowing I cannot carry the weight all on my own. That is not what I am called to do. As people of faith, we are called to, Do justly and love mercy, and walk humbly with our God. That’s soul restoration right there. I do what is put in front of me and I try to do the right thing, knowing God is fully in charge. I am physically tired and frayed at the edges and am open to unique ideas on how to relax, but restoration—my soul—it’s in the hands of Someone much, much bigger than I and there is great soul healing comfort in that. So, Warriors, we don’t have to have it all figured out, but that doesn’t mean we throw our arms up and say, “Well, screw this.” It means we are being the practical hands and feet of our King and we do what we do in spite of knowing that this world, this world, will always be broken until Kingdom order is restored.